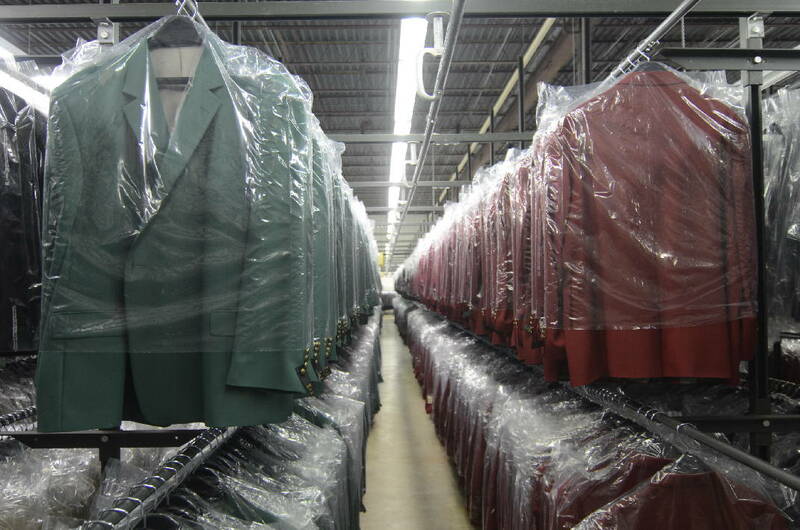 Rows of suit coats hang on racks at Hardwick Clothes in Cleveland, Tenn.
Sandra Woolsey sews at Hardwick Clothes in Cleveland, Tenn.
CLEVELAND, Tenn. -- A year ago, Hardwick Clothes was dying. The 130-year-old maker of fine men's clothing declared bankruptcy, unable to pay its employee pension debt. In the spring, the company's assets went to auction. And then its ship came in. Allan Jones, the millionaire CEO of the Cleveland-based Check Into Cash, cut a check for $1.9 million and bought Hardwick Clothes, the oldest manufacturer in town and the oldest suit maker in the United States. Jones went to work over the next seven months, investing chunks of his personal fortune in the company. Now, Jones says things are turning around. He recently unveiled a blue ribbon panel of executives and newly appointed board members to carry out his plan. He's had $1 million-plus in new, state-of-the-art machinery added to the factory floor. Quality will rule the decision making going forward, he says. Hardwick is still losing money, but by fall 2015, Jones says things at the embattled factory will be on the upswing. He says this team is going to save the Cleveland relic -- one button at a time, if that's what it takes. On the morning of the Hardwick company Christmas party, Jones stood for a while at the back of the room where door prizes were announced and handed out on the heels of a Hardee's biscuit breakfast. The approximately 250 folks who survived years of staff cuts that whittled Hardwick's workforce to a portion of its one-time, 700-employee roster, cheered and clapped each time a name was called. Optimism abounded. Jones walked to the large, CEO's office in another part of the building, which was quiet enough to carry on a conversation, but within earshot of the cheers ringing out from the Christmas party. The Hardwick plan is pretty simple, he said. The founder of America's biggest privately owned payday lender bought Hardwick because it's in his beloved Cleveland, because it's the last of the city's well-known manufacturers and because it is staffed by experienced, committed people. 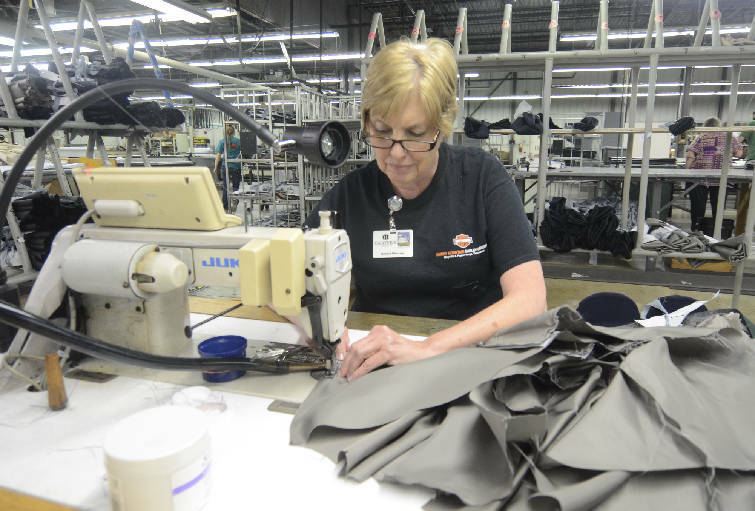 Seamstress Carol Collins works at Hardwick Clothes in Cleveland, Tenn.
"You couldn't train these people today," said Jones. "The most important thing on the balance sheet wasn't on the balance sheet." Some people said it was crazy. 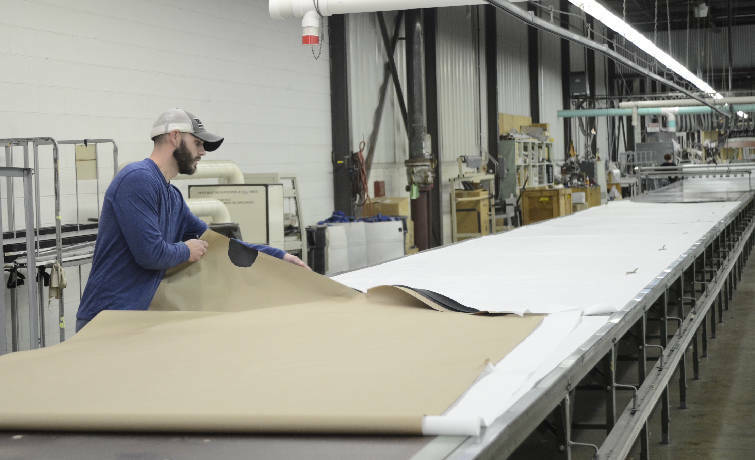 They told Jones he didn't know anything about manufacturing or clothing, and that Hardwick is, at the end of the day, competing with overseas manufacturers who can afford to undercut American clothing manufacturers. None of this was news to him. "This is a very different industry," Jones said. "The chances of somebody who doesn't know what they're doing making it in this industry is not good. I knew that going in." So he found people who know what they're doing. Hart Schaffner Marx clothiers has been making fine men's clothing almost as long as Hardwick. The Chicago-based brand has been an American fashion staple for the past century and was famously worn by Chicagoan Barack Obama when the then-U.S. senator campaigned for president in 2008. Hart Schaffner Marx made a fine target. Jones made a pass at some of the company's top brass and tenured veterans and soon found success. 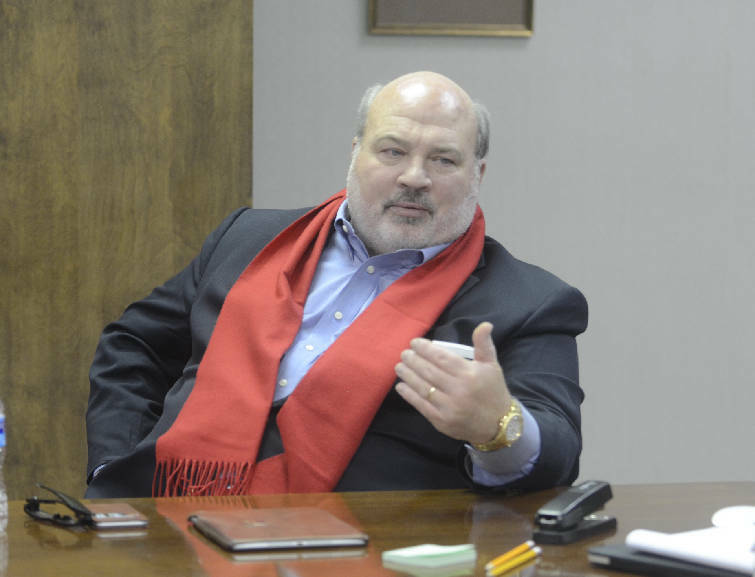 Bruce Bellusci, former executive vice president at Hart, was recently named president and CEO of Hardwick. Bellusci is also on the board of directors. At Hart, Bellusci was responsible for sales, marketing and distribution. Kenneth Hoffman, president and CEO of Hart from 1967 to 2004, was appointed to the Hardwick board of directors. Following Bellusci and Hoffman, Hardwick successfully wooed a couple of Hart's top salesmen. Bellusci, with his Chicago accent and impeccable dress, exuded the same energy and optimism as Hardwick's staff the morning of the Christmas party. "I grew up in the culture of great people and a family product," he said. He said those two qualities are still present at Hardwick, and it made Jones' offer to come onboard that much more enticing. A long-time men's clothing expert, Bellusci was very aware of Hardwick's legacy and its demise. The turbulence that pushed Hardwick over the edge also bothered other players in the American suit industry, he noted. For a time, casual was cool. Saving money was cool. Dropping $300 on a jacket and wearing a suit were not, said Bellusci. Cleveland, Tenn., businessman Allan Jones bought Hardwick Clothes for $1.9 million. Photo by Angie Herrington /Times Free Press. People stopped shopping for suits and jackets. Then the economy shrunk and compounded the problems already stacking up against manufacturers of high-end clothing. As a result, "a lot of the products traditionally made in the United States went offshore," said Bellusci. "It had a drastic effect on the industry, and a lot of companies, Hardwick included, were affected," he said. But like Jones, Bellusci sees enormous potential for the Cleveland manufacturer that's seemingly seen rock bottom and is now poised to bounce back. For one, suit and sport coat fashion is coming back. "It's cool again to look good," said Bellusci. And American consumers are again excited about products made here, versus overseas. The opportunity to play comeback kid with Hardwick was enough to lure Bellusci away from Chicago and land him in Cleveland, a city far removed from the bright Windy City lights, but one that Bellusci says he and his wife love. Jones jokes that in the process of essentially doubling the Hardwick staff, he's also doubled the company's losses. He said Hardwick is losing more than before he bought it, but that it's necessary to get things back on track and get the Hardwick books back in the black. The morning of the employee Christmas party, Jones wore a prototype of the new Hardwick navy blazer. This is where it starts, he said: perfect one thing at a time. 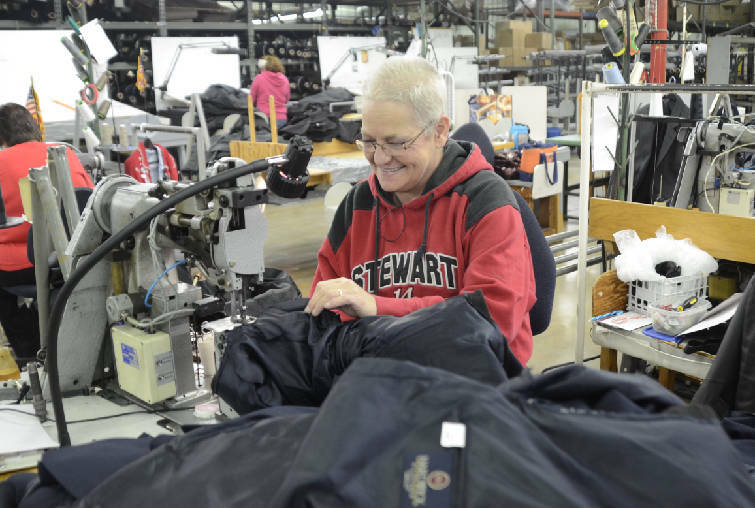 He opened the jacket and showed off the label in the jacket's lining, with "Cleveland, Tennessee" now proudly stitched under the Hardwick name. Matthew Brown works recently at Hardwick Clothes. He pointed out the jacket's brassy buttons -- not quite right, but getting there. Even the buttons must be perfect, he said. Hardwick can't beat Asian factories in price, but it can beat them in quality and attention to detail. When the navy blazer is perfect, it will go to retail. Then it's on to perfecting khaki pants, then the next thing and the next. Jones doesn't know yet if luck is on his side in this Hardwick venture. He doesn't look at the books, because "I don't like looking at bad news," he said. He doesn't talk about hard numbers. Instead, he plugs away, believing that the spirit of the Hardwick name, its employees -- this town -- will prove him right. "There's something about Cleveland that I believe in," he said. Bellusci, the guy asked to complete this mission, likes to put it in baseball terms. Remember the New York Yankees of the '90s, he said. "They were an unselfish team," he said. "Your name and your product are only as good as your people. We have the best people in the industry. I think we're going to be a World Series contender in the next three years." Contact staff writer Alex Green at agreen@timesfree press.com or 423-757-6480.